These limited edition parsnip crisps are cheekily named after the couple. Flavoured with ginger, sweet honey and dusted with edible glitter, the packs will be part of the brand’s core range throughout May. Artisan chocolatier Choc on Choc has launched this thick white chocolate heart adorned with a black and white picture of the happy couple. 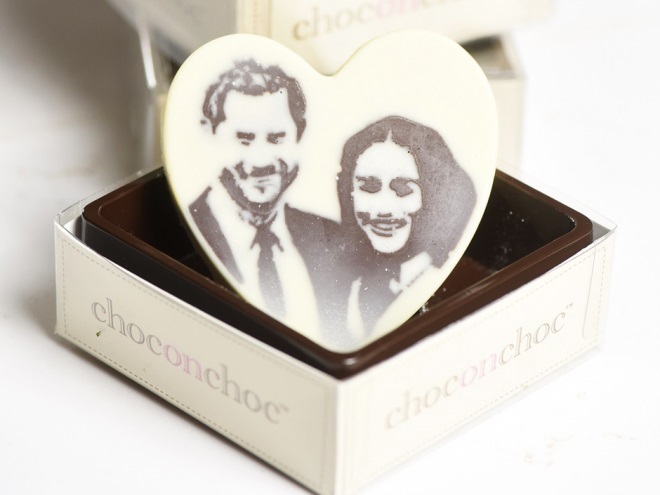 The handmade novelty gift, which the brand says are ”perfect regal chocolate treats to serve up at a Royal Wedding party or as a gift for any patriotic royal fans in your life” are on sale at the Choc on Choc website. Inspired by the flavours of the real royal wedding cake, this elderflower and lemon sorbet will be on sale in farm shops, fine food stores and delis across the south of England. Free from any syrups and preservatives, the sorbet is made by hand in small batches using locally sourced ingredients wherever possible. For one week only from 14 May, this own-label replica of the royal wedding cake will be available in selected Iceland stores. Designed by Iceland head chef, Neil Nugent, this cake was made by following the descriptions of Price Harry and Meghan’s wedding cake and has a “lightly flavoured” lemon sponge, elderflower buttercream and edible pearls. This limited edition decorative tin is filled with all-butter shortbread petticoat tails which are made in Edinburgh. From the sub-brand of The Black Farmer, this special edition sausage features the founder’s Wilfred Emmanuel-Jones’ mixed-race daughter, Scarlett on the packaging. The pork sausages, which are gluten-free, are part of a range of products on their way to shelves in 2018 that will be “celebrating Britain’s diversity”. “The marriage between Harry and Meghan is a momentous occasion for the black communities in the UK. For many black people, the wedding signifies that colour is now part of the mainstream rather than being on the sidelines” said Emmanuel-Jones. Chocolatier to Her Majesty The Queen, Prestat has brought back The Red Box with three new truffle flavours in honour of the royal nuptials. Sweet Clementine is a chocolate ganache infused with clementine oil in a dark chocolate shell, The Earl Grey is a milk chocolate ganache infused with Earl Grey tea and London Gin and Lemon is a combination of London gin with lemon and fizz in a white chocolate shell. Brewed in sight of Windsor castle, the pale ale is exclusive to Waitrose. Another treat inspired by flavours of the wedding cake, Gü says it is ”embracing royal wedding fever” and launching these mini, potted cheesecakes for a limited time. They’re exclusive to Waitrose. To honour the wedding and the coinciding Chelsea Flower Show, Independent Chelsea grocer Partridges has launched a special edition of its Chelsea Flower Gin. The new tipple is infused with bergamot and has “a medley of citrus and coriander with hints of lemon tart and vanilla” according to the brand. The gin is made by Rock Rose creators Dunnet Bay Distillers in Scotland and will be available online and from Partridges’ two stores in Chelsea and Kensington in 50cl and 5cl bottles.